Widows' peaks are common and natural aspects of many people's hairlines. They can also pose aesthetic challenges if they are more clearly pronounced, especially when pulling back hair into sleek and polished ponytails. The side part is one of the best ways to style the hair for those individuals who want to incorporate their widow's peak into their overall hairstyle. This type of part will work to de-emphasize sharp peaks and also add a polished, fashionable edge to any hair texture, from pin straight to curly. Using your fingers, draw a part about 2 inches to the side of the center line of your head that runs from your temple back to the crown of your head. This part can be made on either side, and should look gentle and natural, rather than a straight, sharp part. 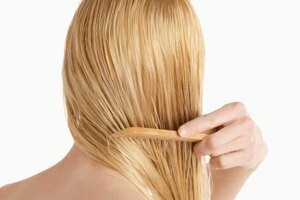 After creating the part, brush the hair smooth using a regular bristle hairbrush. Spritz your hair with a small amount of water from a spray bottle. 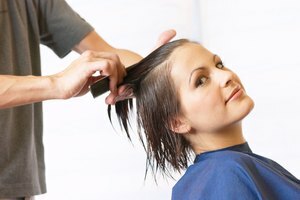 Gently brush the newly parted hair so that is sits naturally over the top of your head and slightly over your forehead. This process incorporates and de-emphasizes the widows peak, while also coaxing the hair to lay flat in the new part. Spray a tiny amount of hairspray on a clean toothbrush. Sweep the hairbrush over any stray hairs that may spring loose from the new part. If you part your hair every day in the same place your hair will naturally fall that way after about a week. Widows' peaks look best in a side part rather than a straight, centered part. Side-swept bangs also work well with widows' peaks. Men can create a slight side part by adding a bit of mousse or styling cream to their hair and gently combing the locks to the side.